Right now we are using a very simple bungee cord attaching the player to a fixed point in the ceiling. This has many drawbacks, including the linear nature of bungee cord stretch and the 'vector problem' that always pulls the player back towards the ceiling mounting point. We'd like to address these in future versions, and are looking for sponsors and collaborators who can help us do so. Please read on for the plans for the next phases. There are a few key pieces of technology that we need to deal with in the future: the ceiling track, the obstacle course, and the method of suspension (called the 'haptic winch'). 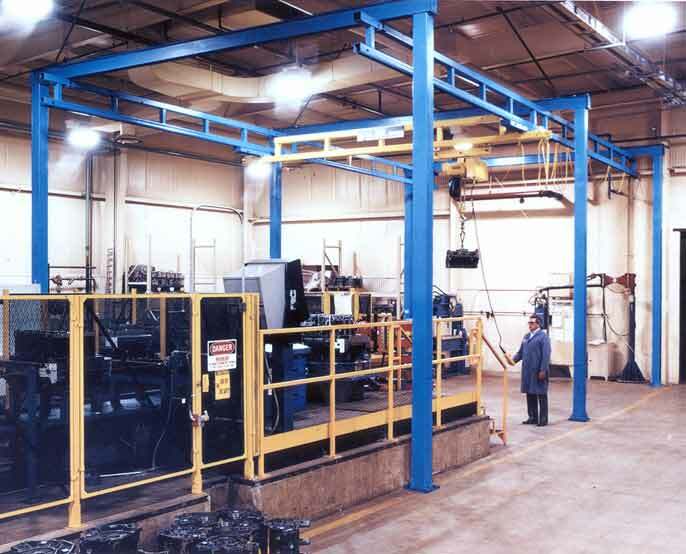 The ultimate ceiling track would be a 2-axis one similar to those used in manufacturing. There are a number of companies that make these, Gorbel being a good example. We would, of course, need a modified version of their crane. First, we would need a much lighter version to have lower inertia and much faster acting motors. Second, and most importantly, we would need to make the track automatically follow the player. This could be accomplished with a downward facing IR camera and some simple software that helps the crane predict where the player is going. 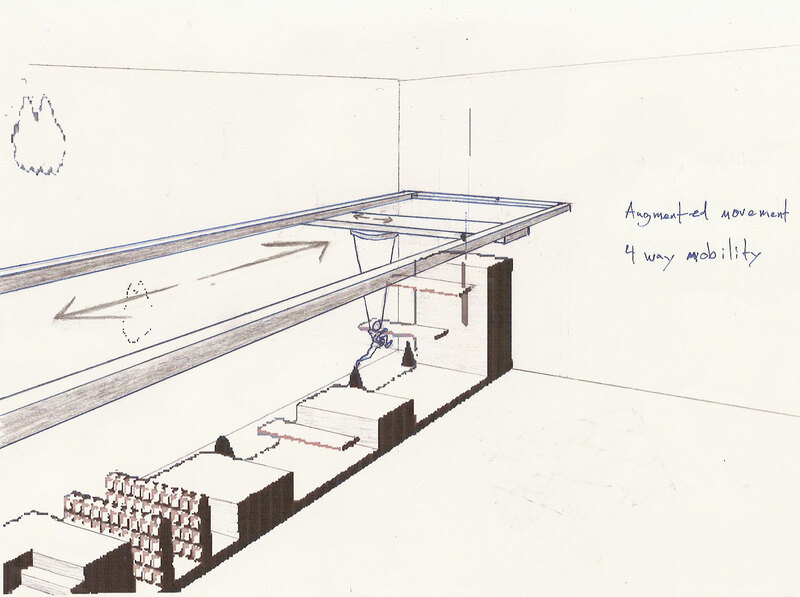 This 2-axis automatic track will be reasonably expensive, so for the next version we are looking at a 1-axis track with the ceiling mounting point pulled by the player's own weight, or by stagehands. 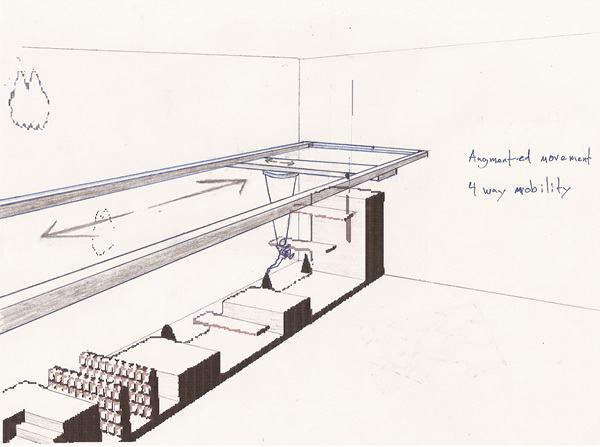 The obstacle course we are proposing would be a few hundred meters long with different challenge areas. The entire area would be constructed of soft foam crash padding. 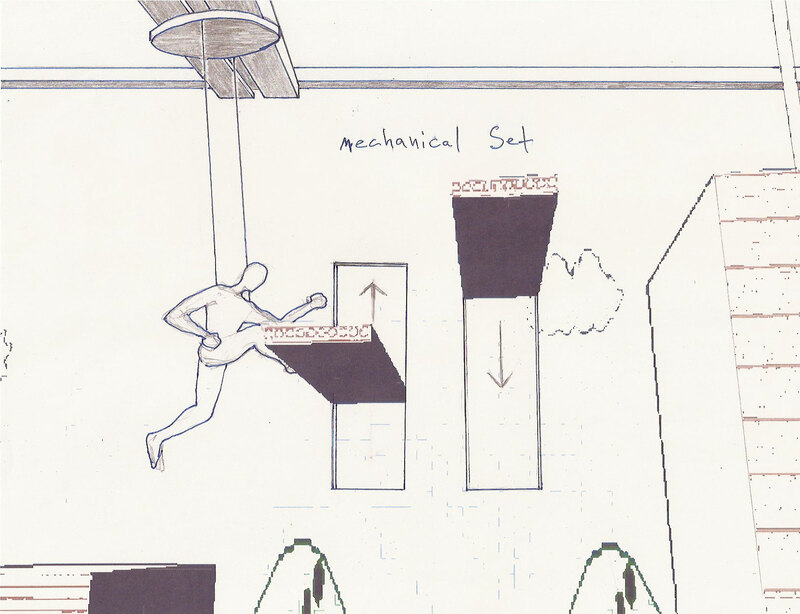 For areas that a player must jump over there would be a foam filled pit, similar to what gymnasts and ski jumpers use for practice. For the mechanical platforms, we are envisioning hydraulic auctuation with mouting from the side so that it is hidden from the player. Since the platforms never get close to the ground or to each other, we don't anticipate a user getting stuck. We will however, have a pressure feedback system similar to the way elevator doors work just in case. The 'haptic winch' is the real technological meat of this project, and where the player will experience the greatest feeling of Physically Augmented Reality. Simple put, the haptic winch is a software controlled winch mounted on the track mentioned above. Strain sensors mounted on the cables feeding back to software that controls the winch is where the haptic aspect comes from. So if the sensors feel a user jump the software can know how fast the user was jumping and give them an appropriately amplified boost. The winch can be programmed to allow the user to have almost any feeling of being in a world of altered physics. For example, the winch could be programmed to act exactly like the bungee cords we are using right now. Despite the fact that the user would be suspended from solid metal wires, the winch control software could pull the user up and down delivering the exact same feeling as a bungee cord does. In our vision, we would have much more advanced winch software that would let a user take off from the ground with amazing acceleration, but put them down as gently as a feather. It could even change the users jumping arc in mid-air, simulating a double jump. And with a recent memory of the players actions the winch could provide a triple jump, or any other action based bonus ability. The haptic winch, in combination with the 2-axis tracking crane above, would be responsible for determining where the player wanted to go in 3D space and delivering them there safely. We've heard a number of skeptics ask questions about the haptic winch, so we'd like to address some of them here, and answer and questions you may have. Please email us at team [ a t ] nintendoamusementpark.com and we will try to respond to all serious questions. We'd also like to hear from interested engineers in this field. Q: Isn't this going to be dangerous? A: Yes, but so is driving a skateboard, snowboard, bicycle, car, or motorcycle or playing basketball, football, and hockey. And yet everyday seemingly rational people do all of those things. But to be serious, we are working towards a safety system that prevents injuries while acknowledging that there will be some bruises. We are most concerned about having no catastrophic injuries, just as is any major amusement park. In the current bungee version, which we have tested on many different sizes and weights of people, we have designed the harness so the user always remains upright and balanced the bungees such that no user has even been able to hit the ground with an serious force. Q: But seriously, what if someone goes splat? A: We have many different redundant safety systems. The first one is in software. Have you ridden in an elevator recently? We have worked with elevator companies on a previous project, and their control software is directly responsible for the lives of all of their passengers. No one feels unsafe in a elevator because of the software, so we think that hiring those engineers can give us a measure of security. Furthermore, we have a mechanical backup. The worst thing would be a total winch software failure that leaves the player falling from a great height. In this case there is a maximum descent speed controlled by a different, and entirely mechanical cable speed limiter, similar to the way belay systems work for mountain climbing. Q: Won't this be incredibly difficult and expensive to build? A: Yes, however Disneyland and other amusement parks spend between 100 and 500 million dollars on each new ride. We know that a very serious technology investment must be made to develop the haptic winch, but once that is in place it can be reused and reprogrammed for many different types of experiences.